Black Cohosh has a long history of use — now backed by scientific evidence — for helping support a healthy female reproductive system. 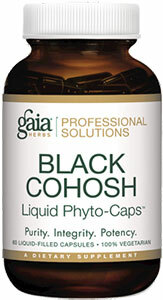 Each serving of Gaia’s Profesional Solutions Black Cohosh Liquid Phyto-caps contains a guaranteed 2 mg of active Triterpene Glycosides. Taken as needed, Black Cohosh can help support a woman’s body during natural transitional hormonal states and reduces risk for breast cancer. Black cohosh (Cimicifuga racemosa) is a plant used in herbal medicine. A member of the buttercup family, it has a long history of use in the treatment of arthritis and muscle pain. Today, however, black cohosh is commonly taken for relief of symptoms associated with menopause. 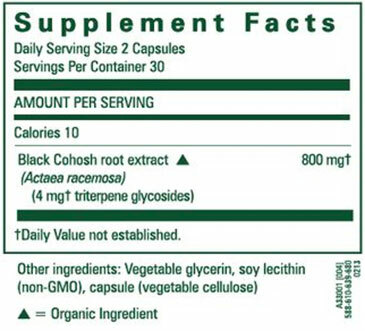 Fukinolic acid (a compound found in black cohosh) appears to have estrogen-like activity. Proponents suggest that black cohosh's potentially estrogen-like effects may be beneficial to women as they experience menopause-related declines in their estrogen levels (a key factor in the development of menopausal symptoms). To that end, black cohosh is sometimes touted as a natural alternative to hormone replacement therapy. Black cohosh is used as a natural remedy for a number of menopause-related symptoms, including hot flashes, night sweats, disturbances in mood, and vaginal dryness. In addition, black cohosh is sometimes used to treat menstrual irregularities and alleviate symptoms of premenstrual syndrome.